3) I feel like it could be a lot to chew through. So, one design at a time here, chaps! Okay, so let's start with an old post from my Danger Room thread - RobertCop! Okay, having finally seen the original film last week, I thought I'd revive a concept that hit the Public Design Post a couple of times back in the day but never really went anywhere - Robocop! 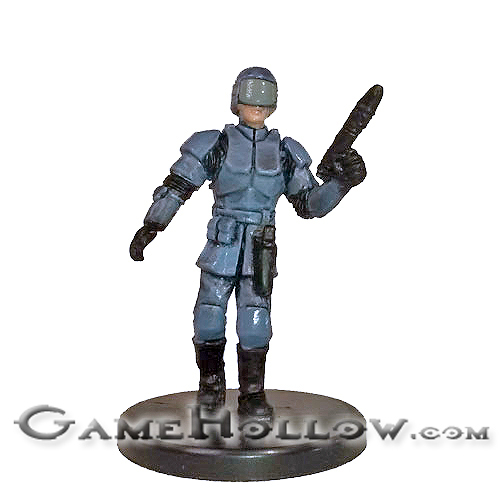 The figure used for this unit is a Star Wars Miniatures figure from the Legacy of the Force set. Robocop may never attack a Civilian, Lawman, or Industrialist unless the player controlling that figure only controls figures with those classes on the battlefield. When attacking a Criminal, Crime Lord or a figure engaged with any other friendly figure, that figure rolls one fewer defence die. When attacking with this Special Attack, RoboCop may attack two additional times and adds two automatic skulls to whatever is rolled. When RoboCop is targeted for a non-adjacent attack and 2 or fewer skulls are rolled, you may ignore that attack. When RoboCop is targeted for an adjacent attack and 1 or fewer skulls are rolled, you may ignore that attack. Prime Directives represents.... well, his Prime Directives - he must uphold the law, preserve the public good, and can do nothing against anyone high up in OCP's payroll (where the Industrialist distinction came in... though I admit that wasn't my idea). The bonus vs. Criminals and Crime Lords is fairly obvious, but I extended it to anyone engaged with a figure you control, to get across the 'preserve the public good' aspect - one of the designs I saw in the PDP got that across with a Heroic Duty-esque mechanic, but I can't recall Murphy jumping in front of any bullets - I can, however, remember him shooting down guys who were actively threatening others with extreme precision, and this should help keep him from just being a Criminal counter-draft and get a bit of that theme in. I considered restricting it to opponents engaged with friendly Civilians, Lawmen or Industrialists, but wasn't sure there. Auto-9 SA just represents his weapon and allows him to make a weaker multi-attack as opposed to his normal. Bulletproof Suit is stolen from Batwoman - I know full body prosthesis really isn't a 'suit', but the power is otherwise perfect for him. Personality I've left blank for now as I'm not really sure. Stoic, maybe? I'd kind of like something to represent him trying to hold onto his last shreds of humanity. Last edited by Lazy Orang; February 7th, 2019 at 04:19 PM. Hmm maybe his bullet proof suit could block all damage until you get a certain amount at once and then it stops working? Not sure. Armor of any sort is difficult to represent in a non-basic way. Not feeling that. The power I like and it's taken straight off Batwoman, I'd just like to tweak it a bit to justify a different name since full-body prosthesis really isn't a suit. I'd ideally like a minor way of tweaking its strength up - the basic 'bullets bounce off me' affect I like. Didn't we come up with an alternative version workshopping Grendel Prime? On my phone, or I'd get it myself. He's in my public thread. When Grendel-Prime is targeted for a non-adjacent attack and 2 or fewer skulls are rolled, you may ignore that attack. When Grendel-Prime is targeted for an adjacent attack and 1 or fewer skulls are rolled, you may ignore that attack. I think it might be interesting to make Auto-9 do an automatic 2 skulls. Makes it seems more "programmed". Then, if you want to roll the dice and do something bigger, you need to go with his normal attack. Also, I definitely like the one design at a time approach. Yeah... RobertCop's kind of a silly in-joke in my family. I think you can thank/blame my brother for originating it, but I may be wrong, could have been my Mum. Oh, and I absolutely love the 2 automatic for Auto-9! No actual dice rolling, just always 2 skulls! That's really distinct and exciting - thank you! Updated the design with the ideas for changes! Unless you snuck an edit in, he’s still listed as Grendel-Prime. I love the programmed fire auto skull concept.